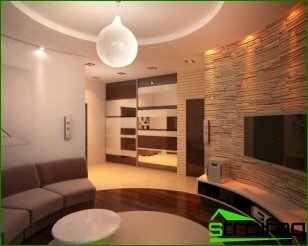 The design of the room should be beautiful all: floor, wall, ceiling, window, door, etc. 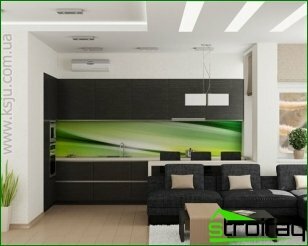 And on what are the materials used for the manufacture of the various elements of the interior it depends on the success of the design work or frequent errors in the design. It should be noted that in the market of building materials can be found unimaginable variety of different decorative finishes. let's consider types of materials for the floorWhich can be applied in the interior of an apartment or house, it helps to know how to perform the decoration of the room with his hands. Today, there are three kinds of materials forflooring: tile, roll and piece. Each type has its own characteristics, advantages and disadvantages. Acquainted with them, you can choose flooring that will best meet your requirements. Probably every known granite,floor and wall tiles that are relevant to the tile materials. By their nature they are substitutes for natural stone, but we should not lose sight of the fact that there are varieties of tiles that mimic the skin and wood. 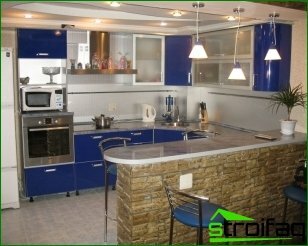 Tiles are durable and highstrength, furthermore it has a high moisture resistance. 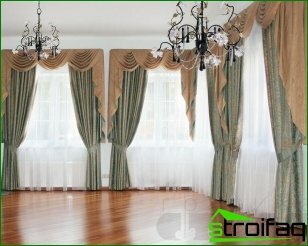 That is why it is preferred to use in rooms with high humidity and areas where the floor is to mechanical shocks. Porcelain has natural advantagesstone and ceramics. Its main characteristics are a low water absorption and high hardness. For its production are used pigments, tiny pieces of rock, and a binder. The most widely used tiles with dimensions of 30x30 cm thickness of 8-14 mm in the standard layout of the apartment. Roll materials for the floor are consideredcork floors, carpet and linoleum. Their main advantages are the last Easy to install, inexpensive cost and the possibility of replacing. But they are not without drawbacks: they are flammable, and they include the presence of chemical compounds harmful. For the production of cork types of materials for the floor used the bark of cork oak. Cork grains are bonded at high temperature with a special adhesive. The result is a sheet that is cut into slabs or coils required shape. Thereafter, they are rubbed hot mixture of wax and beeswax. Cork materials are durable and environmentally friendly, in addition, they have good heat and sound insulating properties, as well as a beautiful decorative texture. Their main drawback is the high cost. From solid wood, which is differentresistance to rot, manufactured decking. It is most often used for swimming pools floors devices, terraces and gazebos. Typically used for its production of high value exotic species of trees. And on the term of operation, it is not inferior to ceramic tiles. The most affordable option is a decking made of larch. It should be noted that the decking is manufactured specifically for outdoor flooring. Its main difference from the typical corrugated board is the external plane, whereby slip is prevented. The back side terrace boards are wide grooves, which are made to compensate for humidity variations and internal stresses. Not so long ago types of materials for the floor expanded decking composite createdof wood-polymer composite. It is a hollow extruded profiles, which include a binder, wood flour, builders, and dyes. Composite decking has the color of the entire mass, which allows it to simulate valuable wood species. It is characterized by durability, strength, besides it is protected from the effects of moisture and rot, sunlight board does not fade. 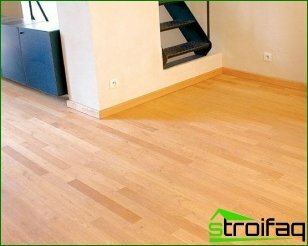 Piece materials are most oftenA kind of wooden floor. They include parquet (set and piece), floor and parquet board, shields and laminate. Laminate is a natural material imitating wood. 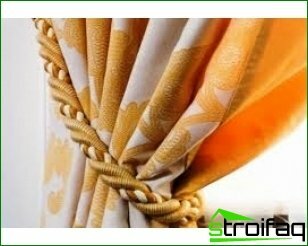 Its wide popularity is mainly due to its low price. In its structure it resembles a fiberboard: from the pressed laminate, separate boards are made, which are then laminated with the help of decorative wear-resistant films. From the drawing of the film depends on the texture of the coating - whether it is a stone or a tree. Its main disadvantage is the poor resistance to impact, especially to the incidence of objects that have sharp angles. As can be seen among all the materials for the floor theremore and less quality. As a rule, high-quality natural materials are more expensive. But if you have the opportunity to buy them - you can use it. If not, then consider options other coatings. 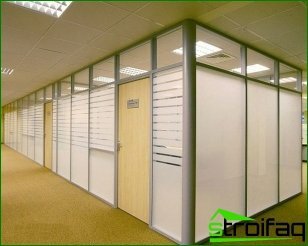 A wide range of materials for the floor will allow everyone to find a suitable product for interior furnishing of room.